Millstone Creek Orchards - What's Fresh? What's Fresh in the Apple Barn? For Thanksgiving week, our bakery is cooking up a storm! We have all your favorites ~ wine cake, apple cake, apple bread, and more! Craft the perfect Thanksgiving meal with an Orchard speciality . 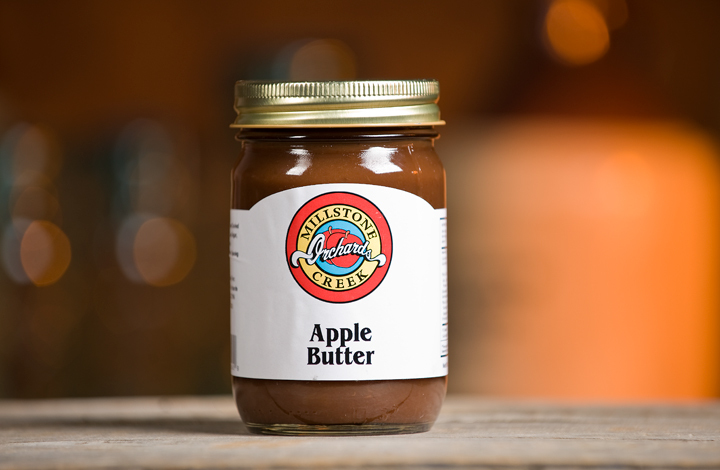 In addition to yummy baked goods, there's always fresh canned goods available in the Apple Barn! A few of our favorites...Apple Butter, Grandmother Isom's Sweet Pickles, and Byrd's BBQ Sauce. What's your favorite? What's Fresh From the Orchard? Fall is almost over, so load up on your APPLES before the season is over! Stop by the Apple Barn to pick up fresh, crisp apples. Stock up on some yummy apples to add to your Thanksgiving meal! Apples are the perfect addition to any baked good and make a great snack! Apple cider is the perfect addition to your Thanksgiving meal, so don’t forget about our fresh-pressed apple cider! Stop by the Apple Barn to pick up a 1/2 gallon ($5.95) of fresh cider. For large orders, call us at 336-824-5263 to reserve your order.